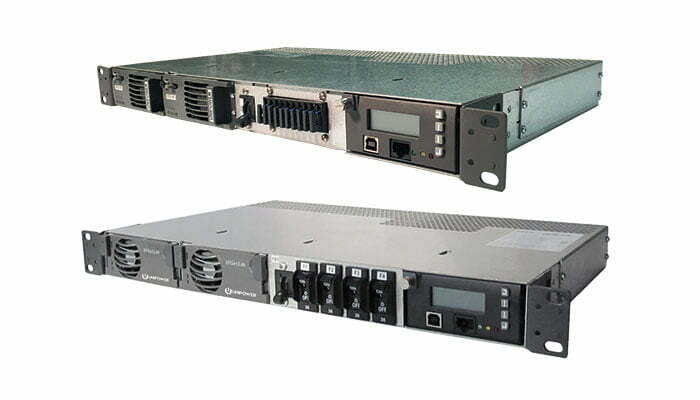 Aspiro 1U is a compact 1RU high 19/23” or ETSI rack-mounted, integrated 45 Amp DC power system providing an output of -48VDC. The Aspiro 1U 45 amp DC power system can accommodate 1 or 2 Aspiro family high efficiency hotswap rectifiers. A total load + charge current of 45A / 2.4kW is available. The rectifiers are internally fan cooled with speed control which is a function of load and temperature, keeping acoustic noise to a minimum. The DC output circuits can provide up to 4 loads with breakers rated from 1A to 30A or 10 loads with GMT fuses from 0.25A to 15A. An additional breaker provides battery protection. A programmable low voltage battery disconnect (LVD) is standard. Ethernet port allows monitoring and control over a TCP/IP network. Web browser support + SNMPv3. Temperature Compensation Charging Allows continuous adjustment of output voltage according to battery temperature. For complete details see the datasheet.